There is no such thing as new music. And there has never been one. Otherwise, when did it start? Was it in 1778 when the futurist intonarumori were first designed by the engineers of Ekhof-Theater? Thirty years before that, when minimalist idea of combination tones were first theorized by Giuseppe Tartini? Or was it in XIII Century when Schoenberg’s “Reihe” were presupposed by Raymond Llull in his computation techniques? Or earlier? Avant Avantgarde is an anachronistic chase for experimental practices in scores, prints and treatises way before terms such as “new”, “contemporary”, “experimental” or “avant garde” music were conceived. We dig in the history not in search of schools and trends of music making. We dig to find maverick who could not wait until XXth century to see themselves becoming silent patrons of most thrilling adventures in sound making. 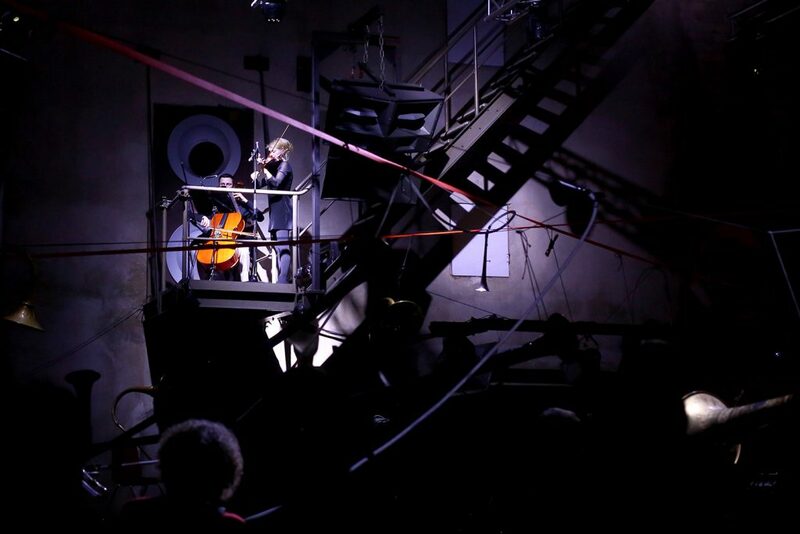 What we find is people working with what they had at hands – objects, burning flames, spilling waters and blowing wind studying the mechanics at the heart of music and heralding sound art. The material researched for Avant Avantgarde forms a body of commissions for four nights of music in Cologne, Krakow, Warsaw, Berlin. Each will contain exclusively world premiers. Dzenana Aganspahic, Burkhard Beins, Arturas Bumsteinas, Max Eastley, Lucio Capece, Francesco Cavaliere, Tomek Chołoniewski, gamut inc, Jean-Luc Guionnet, CM von Hausswolff, Gerhard Kern, Aleks Kolkowski, Michał Libera, Andrew Liles, Magda Mayas, Ralf Meinz, Mikołaj Pałosz, Karolina Ossowska, Razen, Spat’Sonore, Maciej Sledziecki, Steven Stapleton, Thomas Tilly, Jan Topolski, Michael Vorfeld, Marion Wörle and many more will be there to deliver concerts, lectures and presentations on Avant Avantgarde. Over the course of the project gamut inc will be developing a growing automated orchestra of specifically designed music-machines referring to its Renaissance predecessors but expanded with computer controls. Claude Debussy, die Futuristen, Edgar Varèse und John Cage läuteten die Auflösung der traditionellen Musikkultur im 20.Jahrhundert ein. Wie sieht es aber mit der Avantgarde und dem Experiment vor dieser Zeit aus? Pythagoras‘ Experimente mit Schmiedehämmern, Tonvasen und dem Monochord führten zur Entwicklung des tonalen Systems. Die Ideen von Anastasius Kircher im 17. Jahrhundert umfassten sehr ungewöhnliche Instrumente und Klangideen wie die (pneumatische) kosmische Orgel, oder das legendäre Katzenklavier – in dem lebendige Katzen als miauende Klangkörper gedient haben sollen. Die Experimente des Friedrich Chladni mit resonierenden sandbestreuten Metallplatten visualisierten im 18. Jahrhundert Schallwellen und führten schließlich zum Verständnis der Akustik. In exklusiv vorbereiteten Premieren stellt das Programm von Avant Avantgarde eine Auswahl vielerlei Entdeckungen vor: Dženana Aganspahic, Burkhard Beins, Arturas Bumsteinas, Max Eastley, Lucio Capece, Francesco Cavaliere, Tomek Chołoniewski, gamut inc, Jean-Luc Guionnet, CM von Hausswolff, Gerhard Kern, Aleks Kolkowski, Michał Libera, Andrew Liles, Magda Mayas, Ralf Meinz, Mikołlaj Pałosz, Karolina Ossowska, Razen, Paweł Romanczuk, Spat‘Sonore, Maciej Sledziecki, Steven Stapleton, Thomas Tilly, Jan Topolski, Michael Vorfeld, Marion Wörle und weitere mehr stellen für Avant Avantgarde in Konzerten, Vorträgen und Performances an vier Terminen in Köln, Krakau, Warschau und Berlin ihre Ergebnisse vor. gamut inc entwickelt über den gesamten Projektzeitraum ein wachsendes Sortiment an computergesteuerten Musikmaschinen auf Grundlage von jahrhundertealten Ideen und Skizzen. AVANT AVANTGARDE wurde gefördert von der Kulturstiftung des Bundes, dem Kultursekretariat Wuppertal, der Bezirksregierung Köln sowie ON – Neue Musik Köln.